My great grandfather, Horace Hamilton Minkler, track foreman for the CPRR, layed the last rail and final tie before they drove the golden spike, May 10, 1869. He appears in the A.J. Russell "champagne" photograph (see below). ... the track laying record ... 10 miles in a day ... was performed by a group of 8 Irishman under H.H. Minkler, track foreman, and George Coley, gang foreman ... April 28, 1869. H.H. Minkler came to California on the same vessel and worked with CPRR engineer Joseph M. Graham (who, on April 1, 1868, staked out what became Reno, Nevada). As shown on the January 1864 CPRR payroll, James Harvey Strobridge (age 37) and H. Minkler (age 35) worked for three weeks track laying out of Sacramento, California, and both appear together in the A.A. Hart stereoview #350 at Camp Victory, Utah on the day of the 10 mile record. H.H. Minkler layed track through Elko, Nevada, in 1869. 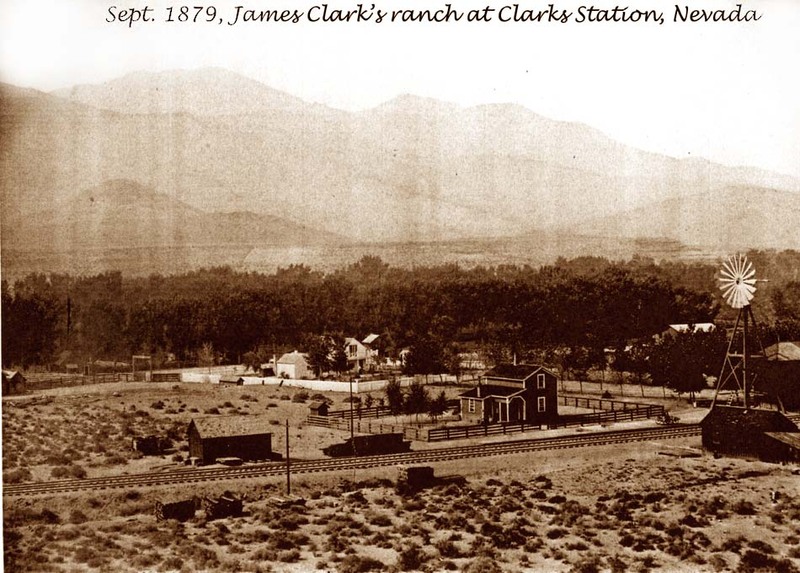 The Depot Hotel and train station in Elko Nevada was owned and run by my great uncle James Clark, H.H. Minkler's brother-in-law. Minkler was married to Sarah Clark of Clark Station, and later became a farmer and Justice of the Peace in Kansas, later living in Missouri. 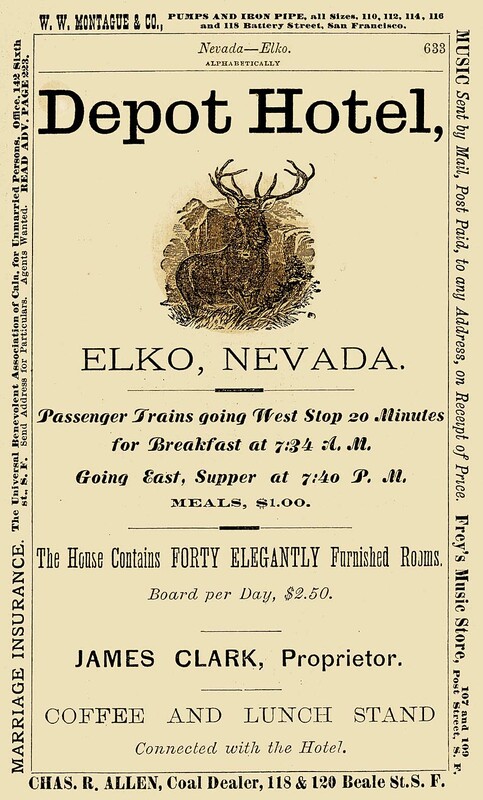 Clark & Green were proprietors of the Depot Hotel in Elko, Nevada, and James Clark was proprietor of the Humboldt House, both meal stops on the Central Pacific Railroad. James Clark died on the same day that the Titanic sunk. About whom David H. Bain wrote: "James Barkley, who has iron in his blood and steam in his nostrils, and history in his family tree." CLICK for James Barkley's notes about Horace Hamilton Minkler, and James Clark. CPRR Track Foreman Horace Hamilton Minkler. A.J. 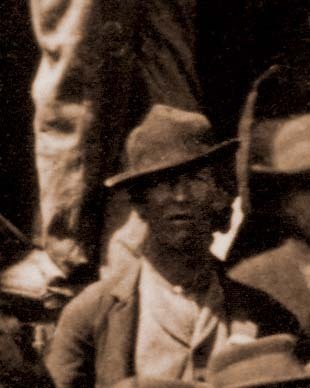 Russell view at Promontory, Utah, May 10, 1869, detail. 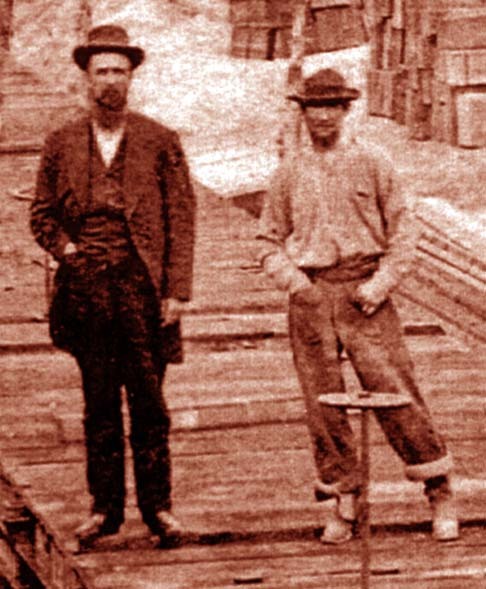 Track Foreman Horace Hamilton Minkler (right). A.A. Hart Stereoview #350, at Camp Victory, April 28, 1869, detail. "Sacramento Gold Spike Centennial Celebration"
Is anyone familiar with "George B. Trumbull's ink/watercolor drawings of train engines"? We have received an inquiry from a person who has three of them and would like to know a little more about him. The following website shows a "George B. Trumbull ... Group of studies of seven American locomotives of the late 19th Century ... Both passenger and freight locomotives ... various railways ... 1895-96, ... Pen and ink, watercolor on paper, 7 1/2 x 17 inches ... "